In response to the UXO call-in, RENEW’s EOD team found and safely removed one 105mm artillery shell and two M72 LAW (Ligth Anti-Amor Weapon) rocket launchers from the new house’s foundation, at a one-meter depth. 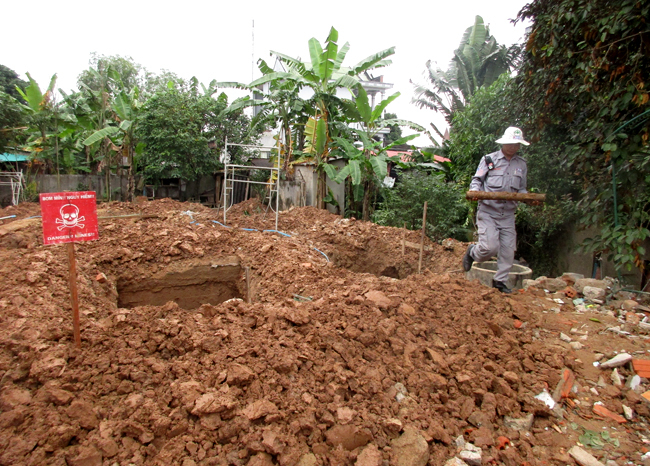 Notified by the workers, Mr. Nguyen Duc Binh, owner of the property where the new house was being built, called his son who is a physician at Trieu Hai Hospital. The 51-year-old MD, Dr. Nguyen Phuc Tinh, immediately reported the discovery to Project RENEW and requested assistance. Mr. Binh’s new house is being built on land near Quang Tri town’s Old Citadel, where one of the bloodiest battles was fought during the Viet Nam War. Mr. Binh moved his family from Trieu Phong District to settle in Ward 2 of Quang Tri Town after Dr. Tinh was assigned to the Trieu Hai Hospital nearby. The family’s neighborhood now is only a few hundred meters from the historic Citadel. 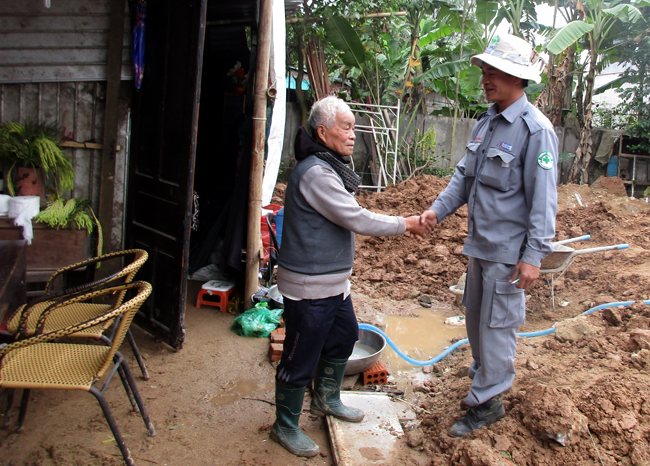 This is the third time that Nguyen Duc Binh’s family has encountered unexploded ordnance (UXO) since they moved into this area. They first found a dozen cluster bombs and rifle grenades in 2002 when they were building a fence for their garden. Then five years ago they uncovered another five items of munitions when building a septic tank for their toilet. A local military unit helped removed those weapons. Following Dr. Tinh’s urgent call on Tuesday morning, Project RENEW dispatched Explosive Ordnance Disposal (EOD) Team No. 1 to the UXO site. The munitions that had been partly uncovered by the bricklayers were found at a depth of nearly one meter. Further excavation by team members uncovered one 105mm projectile and two M72 LAW (Light Anti-Armor Weapon) rocket launchers, each of which contained a 66mm anti-tank rocket. When EOD Team Leader Le Xuan Tung determined that these weapons were safe to remove, he ordered his personnel to transport them to Project RENEW’s Demolition Site for later destruction. Mr. Nguyen Duc Binh thanked the team for their rapid response. After the team departed, the bricklayers resumed their work – much relieved, and reassured.